The desire of healthcare organizations to stand up their own communities of practice (CoP) for patient engagement (PE) is the next big thing in the patient engagement movement, as I am experiencing it. I have been wondering why. What is a CoP exactly? - And what are people trying to solve with a CoP? 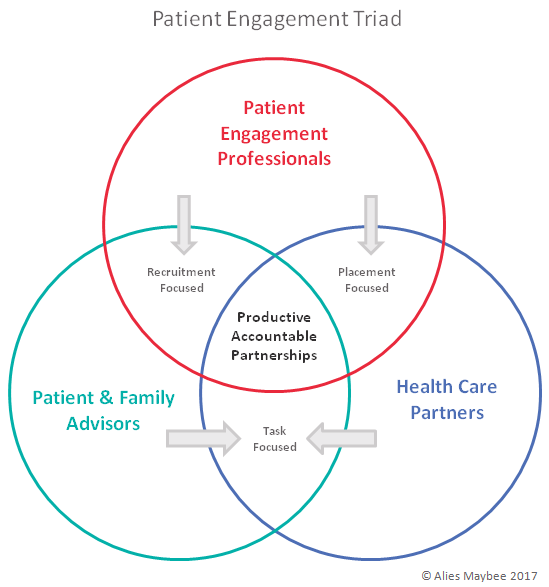 What is the patient engagement practice? - And whose practice is it? 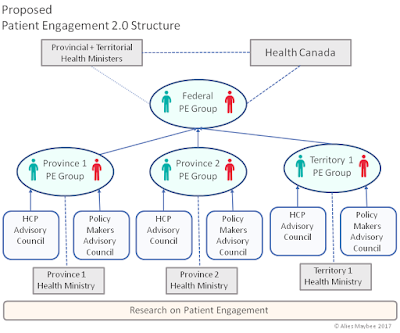 How can we evolve patient engagement to PE 2.0? - What is the CoP role in this evolution? - What is missing in order to move PE forward? Thoughtful Patient Engagement Professionals and experienced patient/caregiver leaders, are telling me they want to move patient engagement to the next level -- Patient Engagement 2.0, if you will. I think this may, in part, be driving the interest in CoPs. I thought I’d do some modest research and put down my thinking on these questions. Communities of practice: what and why? Etienne and Beverly Wenger-Trayner on CoP elaborated on the earlier work of Jean Lave and Etienne Wenger during the 90’s. The Wenger-Trayners maintain that three domains form the critical components to a CoP. They note that CoPs sometimes go by other names like learning networks or thematic groups and characterize a CoP as a social learning model. Practitioners are seeking peer-to-peer connections and bi-directional learning opportunities with or without the support of institutions. Not all CoPs are successful so I think it is worth noting what contributes to their success as these are key factors for a CoP. The Wenger-Trayners go on to list three key success factors plus others that lead to a thriving committee. Identification: Communities of practice thrive on social energy, which both derives from and creates identification. Leadership: A key success factor is the dedication and skill of people who take the initiative to nurture the community. Time: Time is a challenge for most communities, whose members have to handle competing priorities. Other key success factors include: self-governance, a sense of ownership, the level of trust, recognition for contributions, high expectations for value creation, organizational voice, connection to a broader field, interactions with other communities. From reviewing this material, I concluded that a CoP is a peer learning community for individual practitioners that most often is independent of any single organization. Its purpose is to provide the learning and connections that come from shared experiences with those doing the same work. Especially in the world of patient engagement, it makes sense that a CoP is both independent of any healthcare organization doing patient engagement and reaches out to the practitioners across organizations. This raises the issue of “practice”. If we keep that in mind, and look at the world of patient engagement, we find that there are three players each with their own practices. I’ve been thinking about the three players and what they do – what their practice actually is. So below is my take on the practices of the three groups. In the world of patient engagement, let’s understand who is involved, the work they do and how they relate to each other. This is key because each group’s work is its practice. The patient engagement world is the intersection of the three players involved each of whom plays a different role and has a different practice. Patient and Family Advisors (PFAs) volunteer or are paid a modest honorarium to engage with healthcare professionals, on advisory councils, work groups, policy committees, education teams and research teams, and as speakers among other activities. Patient Engagement Professionals (PEPs) perform a specialized version of the Human Resources role where PFAs as non-employees are not subject to the same controls and expectations of performance as employees. PEPs provide the glue, governance and guidance to the engaging of advisors. The Health Care Professionals (HCPs) are staff of the organization who come together sometimes with professional colleagues from other organizations to do a piece of work in collaboration with PFAs. Health researchers can be considered in this category, but engagement with research has a somewhat different approach and will be the subject of a different blog. 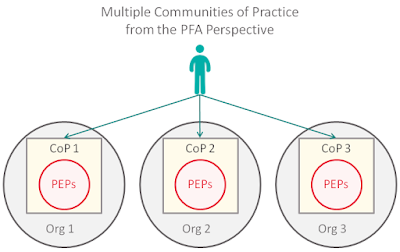 I would argue that a group that includes PEPs and PFAs is not a CoP since there is not one practice but two very different ones as I describe next. There is however, a good argument for a CoP for PEPs and another CoP for Advisors. More on that later. I doubt that the HCPs need a CoP for how they work with advisors. Any acculturation to patient engagement for them is usually handled through training and orientation by the PEPs. The PEPs are hired to perform a modified human resources function and to advance patient engagement within their organization. Their work, issues and concerns – their practice – relates to these tasks. They can and should get help in their practice from other PEPs who understand the work and the issues. Currently in Canada I am only aware of the National Health Engagement Network (NHEN), an informal group of PEPs which has been meeting monthly by phone. Arguably there a real lack of a formal CoP for the practice of patient engagement. As advisors, we focus on doing the work we are engaged to do. There are no credentials to date for PFAs. As much as we can, we look to each other for guidance on how to be an effective advisor. So what forms our practice? Doing the work of our engagement: This involves understanding the topic of the work and its context, our role as advisors, and how to use our experience to further the work of the group. Adapting to Culture: We work collaboratively within a “foreign” culture, a strange system and with impressive and perhaps intimidating colleagues. Dealing with the Practicals: We need to know how to create presentations and deliver them, deal with conference and meeting technologies, handle fatigue and other health concerns while advising, manage expenses and compensation. Dealing with Issues: We need to learn how to deal with tokenism, self-editing, responding to requests for our patient story, handling compensation, making and keeping commitments, expressing unpopular truths in a helpful way. When we sit at the table with our colleagues, we desire to do a good job of advising. We don’t want to waste our time or their time. PAN is not tied to any one organization or any one type of advisor. Many advisors do their work across sites of care and levels of the healthcare system. A number of us cross jurisdictions, particularly in research. It is also provides a community for us especially for those who are isolated from others doing this work. It is a learning community. The “practice of advising” is in no way the same as the practice of PEPs. If the role and value of the CoP is as a peer learning community, it makes sense to have separate CoPs for PEPs and for PFAs. 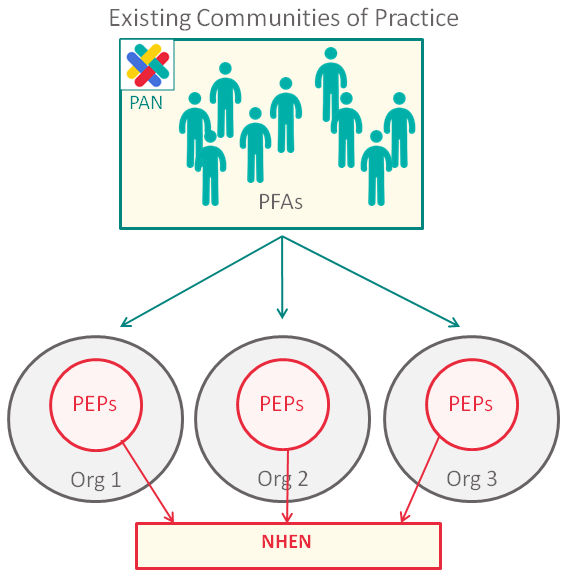 In fact, there are existing national communities of practice for advisors – PAN – and for PEPs – NHEN (see illustration below). These communities need to be strengthened and supported. I wonder if some organizations see the need to mature the practice of PE in their organization and have embraced the concept of a CoP in order to do this. But is the CoP fit for that purpose? If not, how do we mature engagement? How do we evolve to Patient Engagement 2.0? So now let’s go on to the larger question of patient engagement itself. I won’t go into details about what 2.0 might be in this blog, but will take a stab at what I think we need in order to evolve patient engagement. Let’s start with where we are now and why. Why are we engaging patients and caregivers? First, let’s take a step back and confirm that most of us believe that patient engagement contributes to improving the patient experience and patient outcomes of health and well-being. Most of us believe that we all need to work together to improve our healthcare systems. This is, after all, why we are either engaged as advisors, engaging advisors, managing the engagement or making engagement a policy priority. I do recognize that there is little concrete research on the impact of patient engagement. Hopefully that will follow on shortly and help guide where PE 2.0 can be most effective and how. PE 1.0 is uneven and we don’t know much about what works and what doesn’t beyond the anecdotal. We need research to step up quickly and give us some good, hard data with which to plan. Where are we with Patient Engagement 1.0? 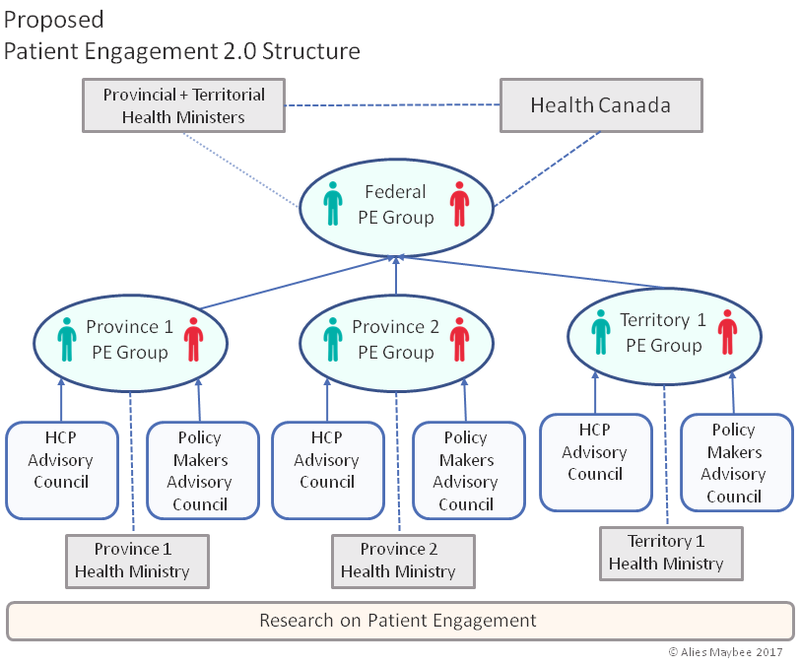 Where are we with patient engagement in Canada at this point in time? Let me start by briefly describing what I see as the current state of engagement or PE 1.0. While BC has had the Patient Voices Network since 2009, it has remained much the same since it was created by the BC government. More recently, Ontario has boldly embedded a Ministry Patient and Family Advisory Council in legislation Oct 2016 and is working to make engagement fully part of healthcare in Ontario. So if that is where we are, then how do we determine where to go next? How do we describe and implement Patient Engagement 2.0? And who are the parties to do this? I think this is what we need to lay the groundwork for 2.0. An increase in skills most specifically for the PEPs and the PFAs. There is also a separate need to address culture and some of the practical aspects of PE for the HCPs. 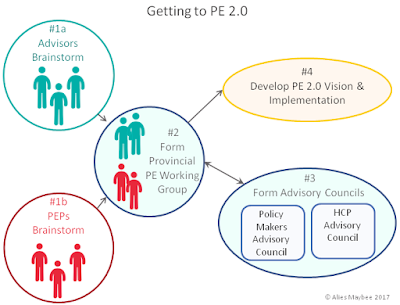 A vision for PE 2.0. We need an implementation plan with priorities for how to get there. A process and structures for moving patient engagement forward. These should be ongoing to sustain the evolution of engagement. 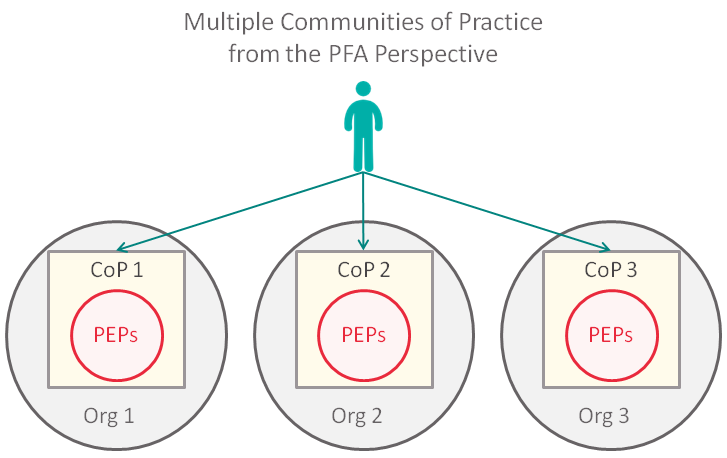 Communities of Practice (or learning communities) for PEPs and for PFAs have a place in augmenting any formal training. Again, note that their practices are different from each other so different CoPs are needed for each. Arguably, the healthcare professionals don’t need a community of practice so much as they need training and guidance from the PEPs. This is not to say we can’t all learn from each other and work together to mature the world of patient engagement. I am questioning how we do this effectively. Patient engagement needs to become a system-wide responsibility supported by legislation so that it is not subject to the vagaries of political change. These changes would naturally fall to the provinces and territories but the federal government would also have a role. Interestingly, Ontario is already moving along this path and pioneering the future. If we are to move to PE 2.0, the greatest opportunities rest at the provincial/territorial level. Although Ontario is leading by embedding patient engagement in the Ministry and the Province through the Patients First legislation, the goal should be to mature and grow patient engagement throughout Canada. All provinces, territories and the Health Canada provide health services, so all jurisdictions need to be part of the evolution. The structure for this is not a CoP; it is a missing structure and has as yet to be defined which I will attempt below. It should allow for PEPs and advisors to work together with healthcare professionals and policy makers. The structure should probably reflect the reality of the Canadian system with PE working groups for each jurisdiction. It might be useful to have representation from each of our 13 health jurisdictions PE working groups plus Health Canada come together to share on an annual basis. This might parallel the Health Ministers meetings or indeed become a part of them. Think of how this might impact health care across Canada! What provincial health minister would want to be a laggard on PE in front of their peers? We should encourage each jurisdiction to move from where they are to their next step in growing patient engagement. In Ontario, a number of advisor leaders and patient engagement professionals are thinking of gathering to brainstorm. We will be experimenting with the structure and process of a jurisdictional PE working group. 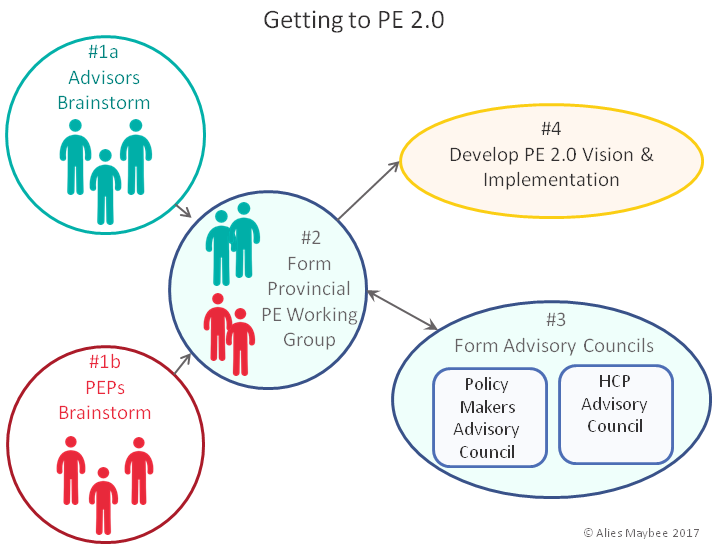 As a start to the PE working group process below, I think we should start with advisors and PEPs meeting separately and then coming together to share. We will have to create the next steps as we go along as this is new territory. Brainstorming: Let’s start with developing a vision coming from experienced thinking. Advisor Meeting: Let's pull together key advisor leaders and add some advisors from other jurisdictions for outside perspectives. Let's be sure to take the time we need. Since advisors come from many backgrounds outside healthcare, and since we have often a system-wide view, our ideas will reflect that. PEP Meeting: Concurrently, the key PEP leaders could do the same exercise. Their unique value is the in-depth knowledge of the system and its internal issues and opportunities so their ideas will reflect this. Outlining the Vision and Setting the Agenda: For the next step, the two groups (Advisors and PEPs) should come together to hammer out a vision of what we think PE 2.0 will look like and how to get there. As we think about implementation, we will need to factor in other groups by creating Advisory Councils for healthcare professionals and for policy makers. I do believe that whatever we come up with and agree on will need to be socialized widely and reality tested. I am concerned that entrenched ways of thinking and doing might inhibit what we achieve. We will need support from the highest level to push past unnecessarily resistant ideas. As with most things, it takes leadership from the top. And for that, in Ontario, we have the support and leadership of the Ministry. Who are the people to take patient engagement forward? As to the “who”, while it ultimately affects all aspects of the health system and especially the Ministry, the two most experienced, motivated and interested groups are patient/caregiver advisor leaders and thoughtful, experienced PEP leaders. This is the place to start. This is who should lead the way forward. Yes, we do need communities of practice but let’s be clear whose practice the CoP addresses and what a CoP is best designed to achieve. Let’s understand how CoPs fit into the landscape of healthcare and the evolution of patient engagement. Let's figure out how best to support them. The practice of advising needs attention and nurturing. This can and is being done in part through PAN, as a CoP, but there is so much more to be done. Patient engagement professionals likewise need support, training and clarity. CoPs for each practice can play a significant role in increasing the skills needed as we move to PE 2.0. Above all, I do think that the time is now and the opportunity is here to define PE 2.0. I sense a hunger to move patient engagement forward and a desire to mature it so that it can start to realize its full potential to contributing to the improvement of the patient experience and patient health and wellness outcomes. After all, that is why most of us became engaged in the first place. •industry as an economic driver and innovation catalyst. It's very significant that patient engagement and empowerment is at the top of the list, and your suggestions might help set us on the path to real change. As a person, patient, caregiver, and patient advisor, I am continually looking for opportunities to bring the patient perspective and work with others to improve healthcare. Copyright held by Alies Maybee. Simple theme. Powered by Blogger.